This blog has served as a place to reflect and analyze on my journey to flipped learning in my high school math classes from 2011-2014. While I have transitioned to a role as a Digital Learning Coach, this blog still hosts my reflections from 3 years of flipping as well as thoughts from my new journey as a coach and support to teachers in their journey of effectively integrating technology into their curriculum. Thank you for being a part of my PLN! Over the next year, I'll be revisiting some of my favorite (and most popular) posts from the last (almost) 5 years of blogging. I hope to add extra insight and reflection to these posts from my experiences both in my classroom and in training and coaching other teachers with flipped learning. Updated comments from the original post are changed to blue font. 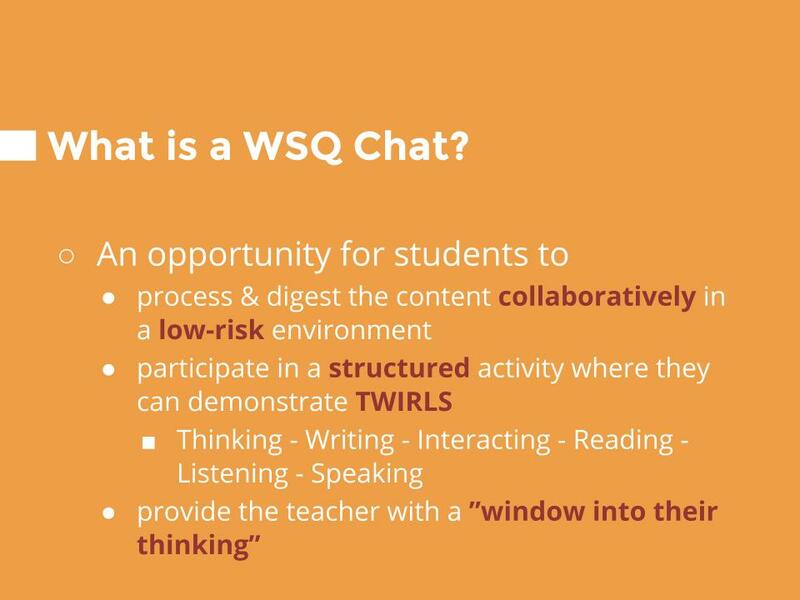 Using the WSQ to deepen student understanding and academic conversations in my Flipped Classroom was originally published on February 21, 2012. 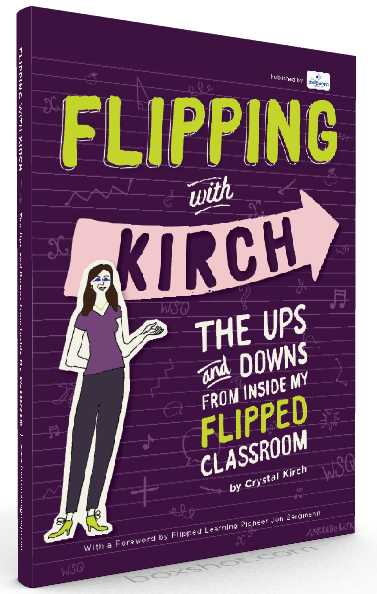 If you are interested in learning more about the WSQ strategy, I recommend that you check out my book, Flipping with Kirch: The Ups and Downs from Inside my Flipped Classroom, which was released in May of 2016. Updated comments from the original post are changed to blue font. Class time… that’s the big question. How do you make a flipped classroom more than just “videos and worksheets”? I did a webinar last night (feel free to check out the archive here) and I think the easiest, yet broadest, answer to that question is: Design your classroom so students are doing more than just worksheets! And of course, the question is, “What do they do then?” And, my answer would be, “What do you want your students doing more of? What would be the ‘something better’ that you could do?” I know, not what people want to hear who want a cookie cutter answer. I can provide ideas of what I did in my class, but that’s not going to be the answer for everybody. 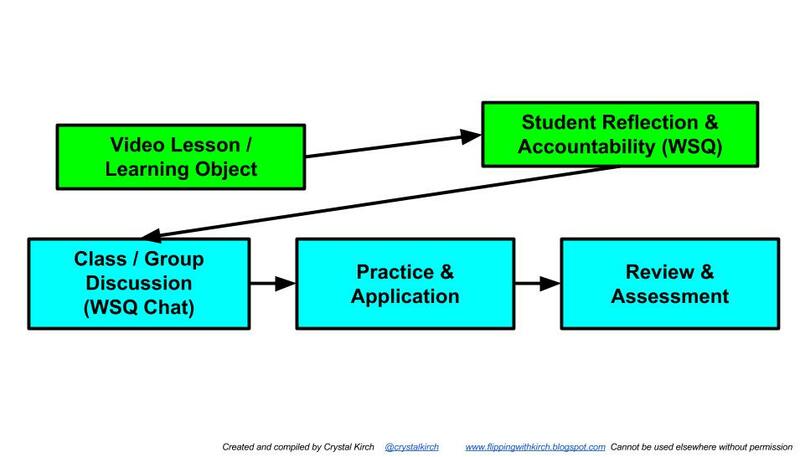 A “flipped classroom” (and that’s in quotes because I don’t think these are really flipped classrooms) can have students just coming in and doing worksheets. But if you begin to answer the question, “What’s the best use of my face to face time?” and “What do I want students doing more of during class time?”, you can truly start the transformation. Flipping (removing direct instruction or teacher-centered / teacher-focused activities outside of the group learning space) gives you the ability and the freedom to rethink what class time looks like. I wanted my students talking more - demonstrating TWIRLS (Thinking, Writing, Interacting, Reading, Listening, Speaking). That was one of my goals. So, I designed activities around that - the WSQ (in Part 3 of my book), WSQ Chats (in Part 4 of my book), Student Blogging (in Part 5 of my book), etc. These activities were only possible because I freed up more class time for more student-centered activities rather than teacher-centered. I also wanted my students to have more individualized support and attention during class time. So, I made sure that I was always walking around, checking in with every group and hopefully every single student individually every single day. I set up my classroom so there was a small group area for me to remediate and reteach “just in time” when needed. This was only possible because I wasn’t “wasting” class time delivering direct instruction or guiding activities whole-class most days. Do you want your students creating more? Presenting more? Designing? Debating? Writing? Explaining? Collaborating? Think through a class period and analyze all the pieces you could REMOVE and place online / outside of class time. And, you’ll have a lot more time to do what you really want! Ok, so you want some practicalities? Here’s what my class time looked like when I first started flipping - just a couple months in. All I really added to the “Video” and “Worksheet” was the WSQ and WSQ Chat - but that made a huge difference in accomplishing my goals at the time! Students come in and get out their WSQ's (kept in a spiral notebook), SSS packets (see FAQ page for details on these guided notes packets), and WSQ sign-off charts. *Students who have not watched the video must tell me before the tardy bell rings and they start watching it on a classroom computer. I usually only have about 4-5 kids who don't watch it, however I have had bad days where 10-11 don't watch it (I have 36-38 students per class). We generally do a quick 1-2 minute review of the important pieces of the video, and if a student has a dire question they want to ask to the whole class, we go over it. Watching your time on this portion of class is key. 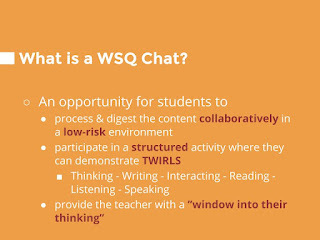 Students get in their WSQ groups and do one of the WSQing methods I am developing. All WSQing methods require that students get a written answer to their question. 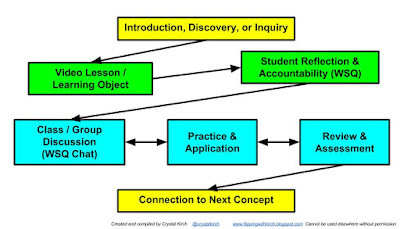 This WSQing time is an opportunity for students to do 3 things: (1) Process & digest the content collaboratively in a low-risk environment; (2) participate in a structured activity where they can demonstrate TWIRLS; (3) provide the teacher with a “window into their thinking” as they participate in the activity and the teacher listens in, probes, ask questions, etc. There are lots and lots of WSQing ideas for the "WSQ chat" portion of class can be found in my new book at bit.ly/FWKirchBook. 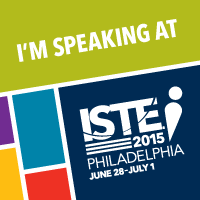 While students are WSQing, I am walking around, listening in, commenting, and probing with deeper questions. This process takes 10-15 minutes, depending on the concept and on the group's ability to stay on task. Again, a timer here is important. It helps keep the students on track and makes sure that they have time to move on to the practice / application portion of class. Sometimes it may only be 5 minutes. I want to emphasize that the teacher's role during this time is huge. You must be walking around and probing the groups! Not only does this keep them on task, it gives you another window into their thinking and helps you to identify common misconceptions that may require a different explanation or clarification. Students get to work on the assigned practice problems for the remainder of the period (30-45 minutes). I walk around and sign off on their WSQ charts. I do not sign off on the summary if it is not complete (at least 5 sentences), and I do not sign off on the question if it is not answered. 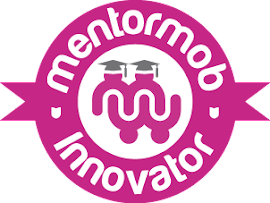 At this time, students are allowed to work with people outside of their WSQ group and possibly move seats to work with a different group. Some years I signed off WSQ charts, some years I didn't. Depends on the level of students and their work ethic / motivation. If students finish the assignment early, they may start watching the new video for that night. Students come in and get out their WSQ's (kept in a spiral notebook), SSS packets, and WSQ sign-off charts. *Students who have not watched the video must tell me before the tardy bell rings and they start watching it on a classroom computer. I generally only have 1-2 students a day not prepared. We generally do a quick 1-2 minute review of the important pieces of the video, and if a student has a dire question they want to ask to the whole class, we go over it. Usually if a question is asked in Math Analysis, before giving the answer, I ask the groups to discuss the answer and then have one of them share out. That way, they are still doing the thinking and I can just guide, support, and follow-up. The WSQing process for Math Analysis is a little less structured. My expectations for them are that they discuss their summaries in their groups and get their question answered somehow. Some days I may give them more specific directions (today I want you to have all your math vocabulary highlighted and/or defined; today I want you to develop one "perfect" summary from your group before you get started on the problems, today I want you to pick your groups "Hottest" question and post it on the whiteboard, etc). Much of this is done on a more small group basis rather than as a whole class. We needed a greater variety of methods for this time in class... this got old fairly quickly. I reflected on that here. There are lots and lots of WSQing ideas for the "WSQ chat" portion of class can be found in my new book at bit.ly/FWKirchBook. Students get to work on their Task List for the day. This includes practice problems, concept quizzes, and videos. Some students may need to watch or re-watch a video. Some students just need to practice a few problems and then they are ready for the quiz. Some students need to spend the whole period practicing the problems. I have started to let them have more and more freedom to self-monitor and self-assess. While I have a few students work ahead, most students are still on pace with the daily expectations. My quote was “You can work ahead, but you can’t fall behind”. Activities continued to evolve for this time of class. I became a huge fan of student creation and student blogging (see samples here) as well as adding inquiry / discovery activities before the video or after a simple introduction video. I walk around and listen, probe, question, and correct while signing off their WSQ charts for the day. If I feel the need to go over something as a whole class because I am noticing common misconceptions, or if I want to do a quick check of understanding and have every group solve a problem and show me the answer (like on a group whiteboard or something), that can happen. It all depends on what I am seeing from the students. I'm leaving this original post intact, since that is the purpose of "revisiting" it. However, class time definitely evolved to have some more structure yet variety in the activities that students participated in. You can't change everything in your class all at once, nor can you do so in your first year flipping. Every year I flipped I continued to modify and add to the different activities for different concepts, as I found methods that I liked and that worked for my students' learning. You'll notice I have a piece at the beginning and end that place the video in an intentional spot in the learning cycle rather than always necessarily at the beginning. Also, acknowledge how concepts connect to one another and "telling the story" of your content is huge. 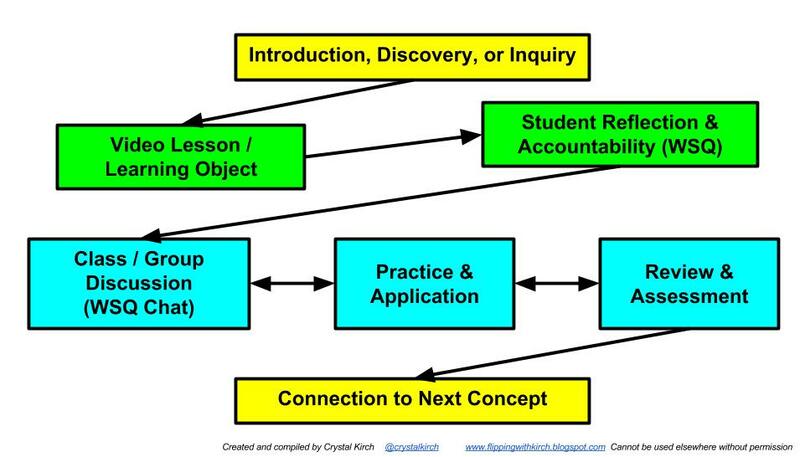 You'll also notice the arrows for the turquoise part go in both directions, because not everything always goes in the the same order and the learning activities need to be placed purposefully. 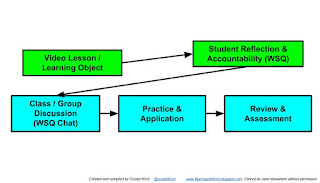 Lastly, the "Practice & Application" box looks exactly the same from the image above; however, the types of application activities students are involved in have improved and transformed. Welcome! Please feel free to check out my FAQ and WSQ (updated July 2014!) pages as your first stop, followed by the "Links I think you should check out" on the right sidebar. I'm baaaccckkk...and I've got a new job! The 7 deadly sins according to CCFLT Teacher of the Year! Start of a New Year- Cheating, Plagiarism, and Collusion - Oh My! Forum Post: Music videos in your class? All content reflects the views of the author.. Simple theme. Powered by Blogger.